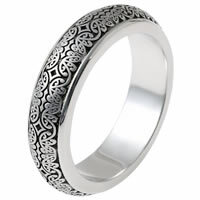 Palladium Verona Lace Wedding Ring Romeo - Palladium, 8.0mm wide, comfort fit Verona Lace Romeo wedding band. Platinum Verona Lace Wedding Band, Romeo - Platinum, 8.0mm wide, comfort fit Verona Lace Romeo wedding band. 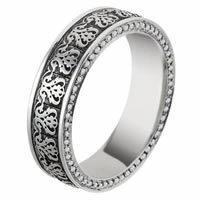 Palladium Verona Lace Wedding Band - Palladium, comfort fit, 6.0mm wide wedding band. 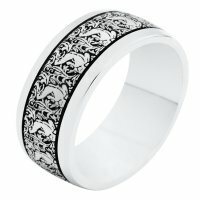 The wedding band has Verona Lace design. Please see V11470PD for matching ladies' ring. 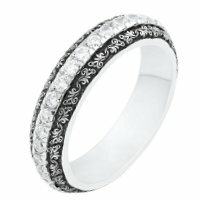 Platinum Verona Lace Wedding Band - Platinum, comfort fit, 6.0mm wide wedding band. The wedding band has Verona Lace design. Please see V11470PP for matching ladies' ring. 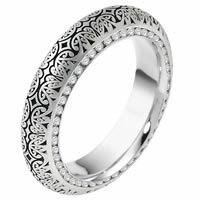 Palladium Verona Lace Diamond Eternity Ring Juliet - Palladium, comfort fit 6.0 mm wide, Verona Lace diamond eternity ring. The pave set holds approximately 102 round brilliant cut diamond with total weight of 0.51 ct.The diamonds are graded as VS in clarity G-H in color. Please see V11473W for matching Mens' ring. Platinum Verona Lace Eternity Ring - Platinum, comfort fit 6.0 mm wide, Verona Lace diamond eternity ring. The pave set holds approximately 102 round brilliant cut diamond with total weight of 0.51 ct.The diamonds are graded as VS in clarity G-H in color. Please see V11473W for matching Mens' ring. 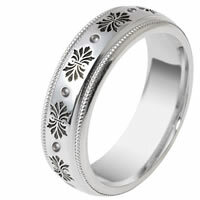 Palladium Verona Lace Wedding Band - One palladium Verona Lace design wedding band. The wedding band is a comfort fit, 6.0mm wide and holds 10 round brilliant cut diamonds with totaL wight of 0.10ct and are graded as VS1-2 in clarity G-H in color.. 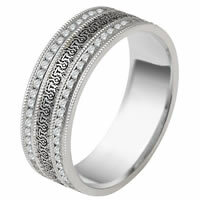 Platinum Verona Lace Wedding Band - Platinum Verona Lace design wedding band. The wedding band is a comfort fit, 6.0mm wide and holds 10 round brilliant cut diamonds with totaL wight of 0.10ct and are graded as VS1-2 in clarity G-H in color..
Palladium Verona Lace Wedding Band - Palladium, 6.0mm wide, comfort fit, Verona Lace design wedding band. See V11472PD for matching ladies' ring. Palladium Verona Lace Eternity Wedding Band - Palladium, 5.5mm wide, comfort fit, Verona Lace design, diamond eternity wedding band. The wedding band holds 114 round brilliant cut diamonds each 0.005ct . The diamond total weight in size 6 is approximately 0.57 ct. The diamonds are graded as VS1-2 in clarity and G-H in color. Platinum Eternity Wedding Ring Verona Lace Juliet - Platinum, 5.5mm wide, comfort fit, Verona Lace design, diamond eternity wedding band. The wedding band holds 114 round brilliant cut diamonds each 0.005ct . The diamond total weight in size 6 is approximately 0.57 ct. The diamonds are graded as VS1-2 in clarity and G-H in color. Palladium Verona Lace Wedding Band, Romeo - Palladium, 6.0mm wide, comfort fit, Verona Lace design wedding band. See V11474PD for matching ladies' ring. Platinum Verona Lace Wedding Band, Romeo - Platinum, 6.0mm wide, comfort fit,Verona Lace design wedding band. See V11474PP for matching ladies' ring.